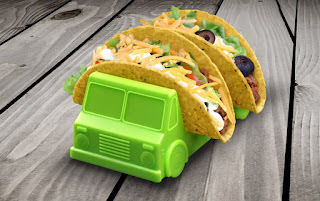 What do you think of this TACO TRUCK Taco Holder? Drive Fred's TACO TRUCK up to your messiest eater and marvel at how it serves the goods. Two truck set: One truck is salsa red, and the other is guacamole green. BONUS QUESTION: Who has the best price? Usually it's the US Amazon site, but today the UK site has the best price, while the US and Canadian site are almost the same price!